Home » Equine » What color is my horse? 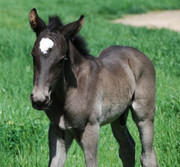 » Any photos of black foals and their coat changes? 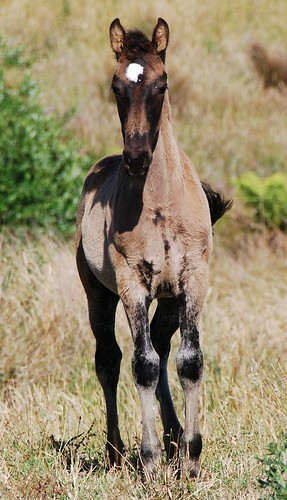 Any photos of black foals and their coat changes? 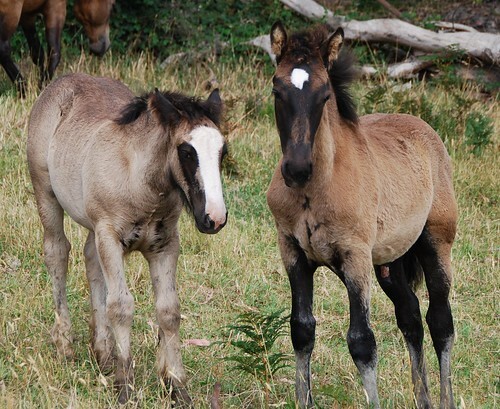 Re: Any photos of black foals and their coat changes? :P Thank you Angela, that is very nice to hear. I agree they are yummy ponies - congrats on your breeding! Very interesting! I always thought ears were a pretty good indicator! So do you think this colt looks smokey black? Hmm Danni, not really game enough to guess. Leaning towards black, but really it is only a guess. Pull out some hair & send it off, only way to know for sure. Here is another of mine. Absolutely no chance of being smoky. New born, lookat the hair in her ears. Danni, any blue in the eyes? That's more reliable than the ears, although still not that good. Thorwood, that last lot of pics you put up, what colour did that foal end up being? Looks very much like our 4 mth old colt does now. no chance of smoky black for him, what colour are the sire and dam? I've never noticed any blue, would he still have it now? I always thought his ears never looked much different from the black filly, so thought he probably wasn't a smokey black. But everyone else who sees him seems to be convinced he's smokey black. So I figure I'm pretty useless at picking smokey blacks as I've just seem too many different shades of black!! 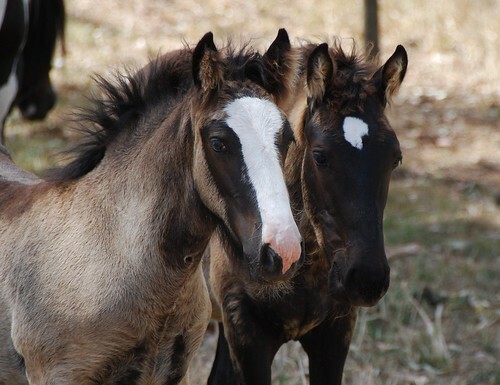 Greenlich, the parents of the filly are homozygous black & chestnut. She can only be black or bay of some shade if mum carries agouti. Ebony went thru' those sorts of colour changes (with noticeable barbs on her sides and a dorsal). Only colour choices readily available are black and chestnut (mum and dad both Ee aa) barring any modifiers since neither parent were tested for modifiers. Do you have any pics, diane? Actually, I do...I have some head/eye shots showing that golden glint around the eye. Never could get pictures where her barbs showed up. Be interesting to see what comes with her winter coat this year, as she's a yearling now. Diane, do you think you could put some up? would love to see her colour changes. 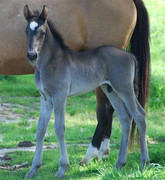 This one shows the mushroomy colour of her foal coat, with the slicker coat underneat showing around her eyes. I need to do some more digging to find the one that shows the golden glints around her eyes that developed after she did her full foalshed. You have one somewhere that shows the striping as I saw it. Nah as this forum wasn't started until March '09... wouldn't she have been about 6 months before that? Yeah, she's an October 08 baby...heck, I guess she almost qualifies as a long yearling now. Where does time fly? I would like to know what colour my foal will be her mother is a black and white pinto the dam of mother is black and the sire is black and white pinto the sire of the foal is hetro for the chestnut gene. That foal looks very bay. That foal looks very bay. However, that shouldn't be possible if the sire and dam are both black. That means that either the sire is the wrong horse or one of the parents isn't really a black. Then the foal is bay. I see no sign of silver.